If your hardwood floors are heavily soiled, you may have to use the "forbidden wood cleaner"–soapy water. 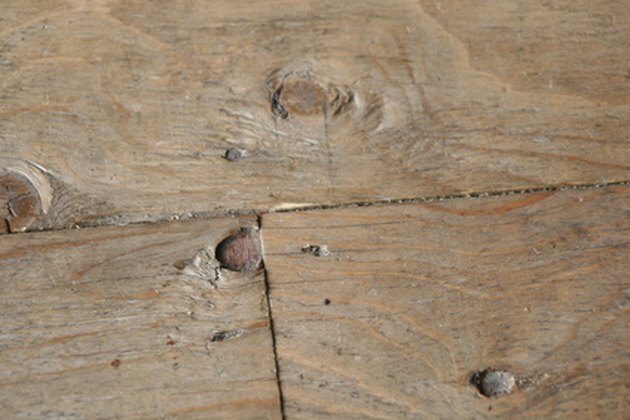 Water and soap can damage wood and get between the floorboards, causing the boards to swell or making the subfloor damp. But occasionally, when floorboards are really dirty, you may need to get rid of the surface dirt and grime to see what other problems you may have. If you are careful not to slosh water all over the floor and you also dry the wood quickly, you can then use wood-cleaning agents to restore the floor to good, clean health. Wipe the floorboards one at a time, using an old cloth dipped in soapy water. Wipe off the excess water and dirt with a dry cloth as you go along, making sure no water gets into the gaps between the floorboards. If the dirt is stubborn, rub with a soft-bristled brush, then wipe off with a soft cloth. Use water sparingly to minimize damage. Test to see if your floor has a wax finish. Water creates a white spot on wax, but will soak into bare wood or form bubbles on the surface if the finish is oil. Denatured alcohol makes shellac dissolve; paint remover makes polyurethane and paint bubble; lacquer thinner, nail-polish remover or paint remover make varnish crackle. If the floor has layers of wax, it can look dirty and dull and you may need to remove the wax and then re-wax. Remove any scuff marks or black heel marks with a cloth dampened with mineral spirits or a proprietary wood cleaner. Rub the affected area and wipe with a clean dry cloth. Be careful when using any solvent on bare boards as some solvents can darken the wood. Remove grease by freezing it first with a pack of ice or frozen vegetables and then scraping off with a paint scraper or knife. Be careful not to scratch the floor. This method also works for tar. To remove crayon marks, rub with mineral spirits, or try rubbing with a little toothpaste, then wipe clean with a soft cloth. Remove layers of old wax (if the finish is wax and it is looking yellow and grimy) with a proprietary wax remover. Follow the manufacturer’s instructions. Clean the whole floor with a proprietary wood cleaner. The wood needs nourishing after being cleaned with water, soap and solvents. If you removed old wax, re-wax your floor by applying wax with a rag or brush, then buffing with a soft cloth or buffing machine. Follow manufacturer’s instructions for application and drying times. Always test cleaners and solvents on a discreet area of floor first as they may darken the wood or damage the finish. Modigliani Brooks started writing books in 1995. Her work has appeared in publications such as "Tearaway" magazine and The Ebook Collection. In addition to a Bachelor of Arts (Honours) in English from Massey University, Brooks trained as an editor at Chapterhouse Publishing in the UK.